Our way to your heart is through your kitchen. Custom cabinetry for any room in your home. Let our cabinet design specialists guide you. 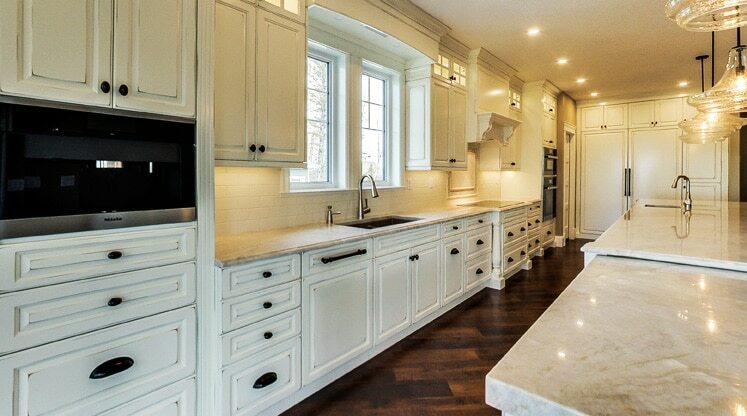 Integri Kitchens is Edmonton’s premier custom kitchen design company. Since 2007, Integri has been guiding client’s home renovation projects from imagination to installation. Home or office, renovation or custom build, the uniquely qualified staff provides expert advice on interior design concepts to high quality cabinetry and materials to final install. We are kitchen and bath specialists, but we have the expertise to provide beautiful cabinetry and design for any room in your home. The dynamic, innovative, award winning Integri Kitchens team works collaboratively with clients in a personable low stress style, helping clients realize their perfect kitchen or bathroom. Our team includes interior designers, contractors, and cabinet suppliers who work together with home builders, plumbers, electricians and carpenters to create your dream home. We provide unsurpassed workmanship and use only the highest quality products to complete your kitchen, bathroom or home renovation. When you work with Integri Kitchens, rest assured you will receive top-quality work at a price that fits your budget. Kitchens, bathrooms, bars, entertainment centres, closets; contemporary to traditional, our designers will customize your project specific to your tastes, needs, and lifestyle. We work with only the best suppliers in the kitchen cabinetry and home remodeling industry, including Schaub and Company, Blanco Professional, Caesarstone, Cambria, Dekton, Emtek, Kindred, Liberty Hardware, DeWils, and Nickels Cabinets. If you are a homeowner in the Edmonton, St. Albert or Sherwood Park area and are building a new home or considering a home renovation for your kitchen, bathroom, home bar or basement, then Integri Kitchens is your best choice. We will assist and guide you through every part of the remodelling process from design to completed project. Call us today to schedule your consultation. Integri provided all we could ask for in our most recent kitchen update. Karen was thorough, extremely knowledgeable & watched over every step of our renovation. Nothing was left to chance. We were so pleased & comfortable having her look after us. My wife and I have had Karen Smith from Integri Kitchens do work in 4 homes for us over the years. After consultations, she has always amazed us with her designs, and the finished product always exceeds our expectations. The quality of the product and the installation is always first rate. She sets out a budget and we've never had an issue of going over budget. We could certainly recommend Karen and Integri. Karen was incredible to work with. She took the time to get to know us and assembled some amazing ideas for us to pour through. She was patient and considerate even when we picked out something crazy. Karen was always professional and listened to our ideas/thoughts while making suggestions of her own. 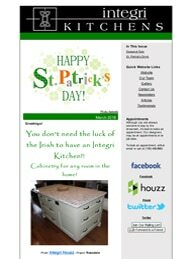 If your looking for kitchen or bathroom cabinetry check out Integri Kitchens! Our renovation project exceeded our expectations and has been admired by all! Thank you for creating something wonderful to come home to.